Browns Quarterback Johnny Manziel Hopes to "Regain Everyone's Trust"
File - Quarterback Johnny Manziel #2 of the Cleveland Browns warms up before a preseason game against the Washington Redskins at FedExField on August 18, 2014 in Landover, Maryland. Browns quarterback Johnny Manziel has apologized to the team and its fans and asked for privacy during his recovery from an undisclosed substance problem. Manziel released a statement through the Browns on Friday. He thanked doctors and staff at Caron, a Pennsylvania facility which specializes in the treatment of drugs and alcohol. 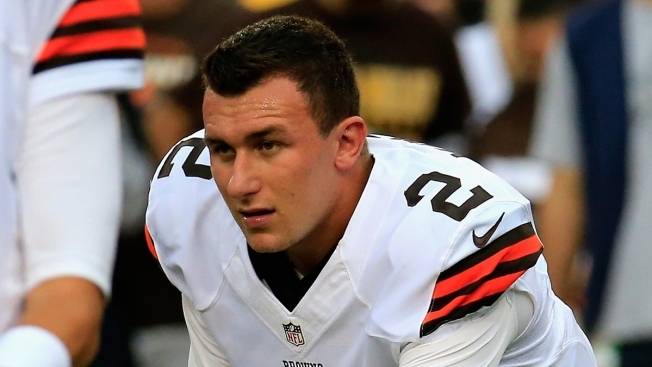 Manziel was discharged last week following a 2 1/2-month stay. Manziel says he takes "full responsibility for my actions" and he intends to "work very hard to regain everyone's trust and respect." Manziel, who earned his "Johnny Football" nickname while winning the Heisman Trophy as a freshman at Texas A&M, intends to attend Cleveland's offseason practices next week. Earlier this week, he attended a Texas Rangers game followed by a visit to see the Dallas Mavericks play. Manziel had a rough rookie season in 2014. He spent most of it as the team's backup before making two starts.